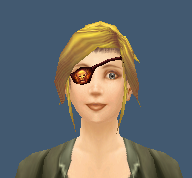 A great eyepatch for mail-wearers with a skull on the patch, it is the only eyepatch in Mail for those wanting to transmog this one. Expect this one to be popular in 4.3 especially since it is a quest reward, as long as you haven’t completed it yet. This entry was posted in Blade's Edge Mountain, Mail, Red and tagged Quest reward. Bookmark the permalink.